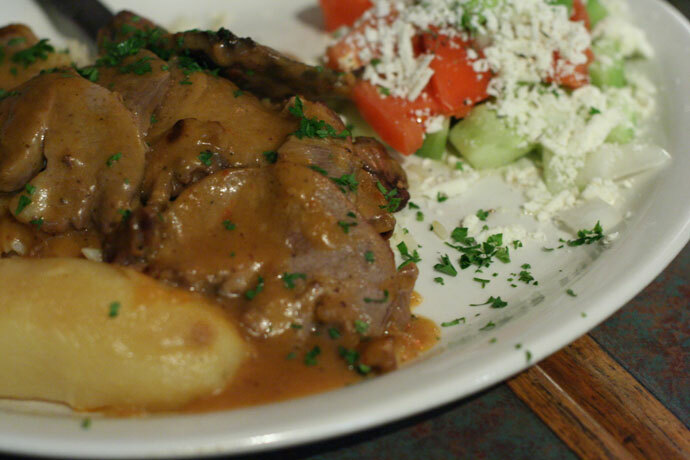 Simpatico Ristorante (map, 2222 West 4th Ave, Vancouver, BC, Canada, 604-733-6824) is one of Vancouver’s oldest Greek restaurants, a long standing place for tasty and authentic Greek food since 1969. Butterknife-tender roast lamb and crusty whole-wheat pizza are the specialties in this traditional Greco-Roman family restaurant. At Simpatico Restaurant, we were greeted by a friendly server who guided us to a table with a blue checkered tablecloth by the window. The main dining room is bright and airy with several skylights, and a large number of healthy plants all around the room. The couple next to us were speaking Greek and there was a large well-dressed family group at another table who were having a great time. My friend and I both ordered the same thing: the Lamb Souvlakia (pictured below) which came with Greek salad, rice, potatoes, and a skewer of premium lamb garnished with fresh herbs. The dish was a reasonable $13.99 and was quite a generous portion. I’ll definitely be back to try their pizza, which the server said is one of their specialties. Lamb Souvlakia ($13.99) from Simpatico Greek Restaurant in Kitsilano, Vancouver, BC, Canada. 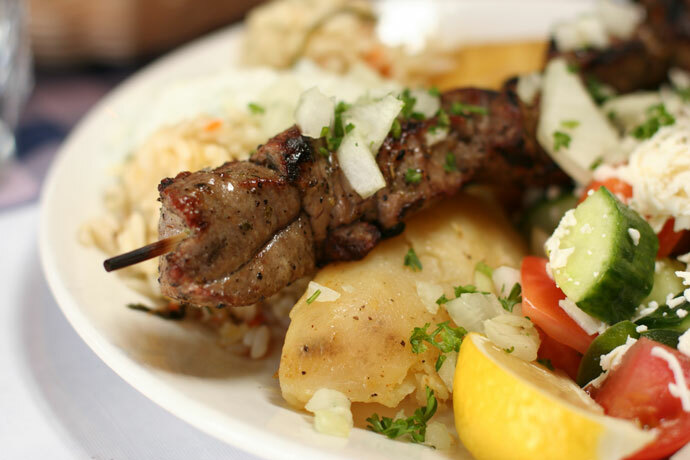 A closeup shot of the Lamb Souvlaki from Simpatico Greek Restaurant in Kitsilano, Vancouver. 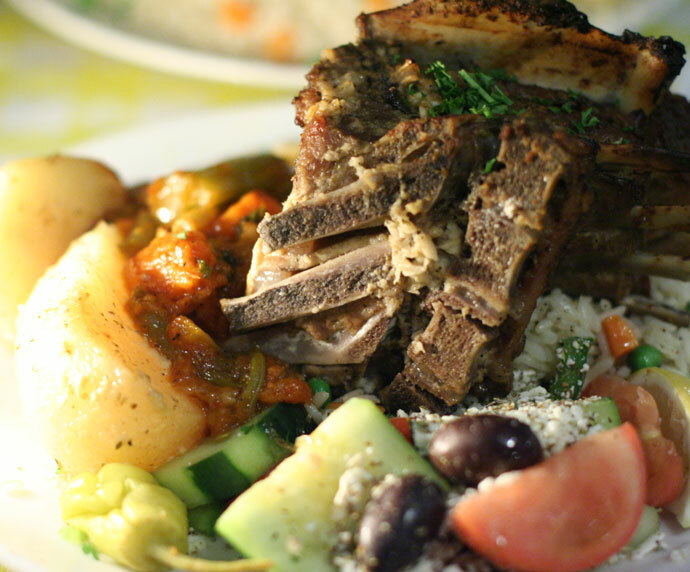 Pictured below is the roast lamb, which is a steal at $8.99 and is served with rice, potatoes, Greek salad, and a very tasty tomato ratatouille (something that you don’t usually find at Greek restaurants). Everything on the menu is under $10, and the wine is also reasonably priced. Ouzeri Greek Restaurant (restaurant’s web site, 3189 West Broadway, Vancouver, BC, phone 604-739-9378) is located in the Kitsilano neighborhood of Vancouver, in the “Greek Town” area of West Broadway that also features several great Greek delicatessens and other Greek restaurants. “Greek day” (web site) is an annual street festival that happens in this neighborhood in June, and is worth visiting for the food and family fun. At Ouzeri Restaurant, I enjoyed their lamb special, which was slices of lamb roast served with gravy, a deliciously marinated Greek potato, some boiled peas, and a yummy Greek salad (pictured below, $16.95). The price for entrees at this restaurant is in the $14 to $18 range. They also have a decent wine selection; the numerous bottles are displayed in a rack along one wall of the restaurant. View More Restaurants in the Greek category. 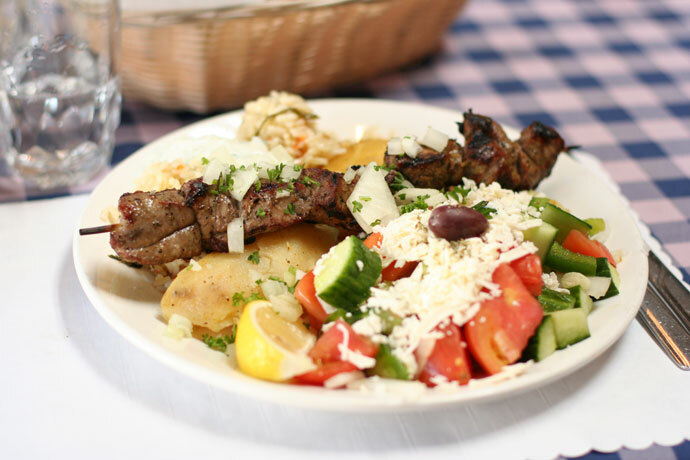 We hope you enjoy the great Greek restaurants on Dine Out Here Vancouver.